The Mars 2020 rover mission is part of NASA's Mars Exploration Program, a long-term effort of robotic exploration of the Red Planet. The Mars 2020 mission addresses high-priority science goals for Mars exploration, including key questions about the potential for life on Mars. The mission takes the next step by not only seeking signs of habitable conditions on Mars in the ancient past, but also searching for signs of past microbial life itself. The Mars 2020 rover introduces a drill that can collect core samples of the most promising rocks and soils and set them aside in a "cache" on the surface of Mars. A future mission could potentially return these samples to Earth. That would help scientists study the samples in laboratories with special room-sized equipment that would be too large to take to Mars. The mission also provides opportunities to gather knowledge and demonstrate technologies that address the challenges of future human expeditions to Mars. These include testing a method for producing oxygen from the Martian atmosphere, identifying other resources (such as subsurface water), improving landing techniques, and characterizing weather, dust, and other potential environmental conditions that could affect future astronauts living and working on Mars. The mission is timed for a launch opportunity in July 2020 when Earth and Mars are in good positions relative to each other for landing on Mars. That is, it takes less power to travel to Mars at this time, compared to other times when Earth and Mars are in different positions in their orbits. To keep mission costs and risks as low as possible, the Mars 2020 design is based on NASA's successful Mars Science Laboratory mission architecture, including its Curiosity rover and proven landing system. All relate to the potential of Mars as a place for life. The first three consider the possibility of past microbial life. Even if the rover does not discover any signs of past life, it paves the way for human life on Mars someday. The Mars 2020 rover also conducts other scientific studies related to its four objectives. For example, the rover monitors weather and dust in the Martian atmosphere. Such studies are important for understanding daily and seasonal changes on Mars, and will help future human explorers better predict Martian weather. The mission relies on successfully demonstrated technological innovations, especially for entry, descent, and landing (EDL). Like NASA's Curiosity rover (Mars Science Laboratory mission), the Mars 2020 spacecraft uses a guided entry, descent, and landing system. 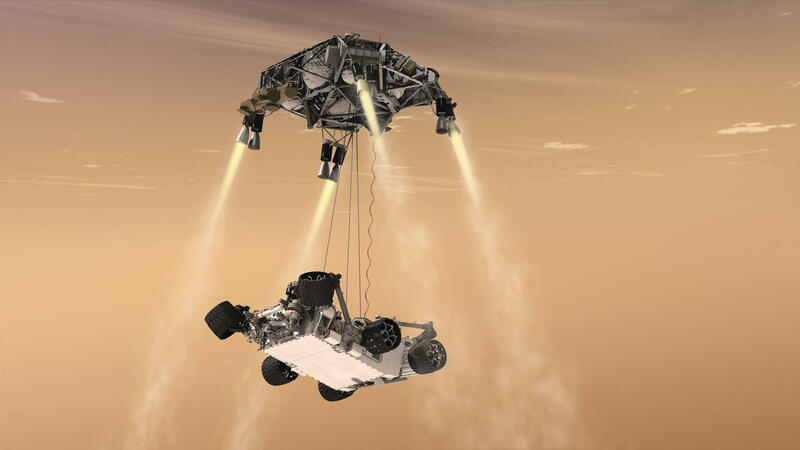 The Mars 2020 mission landing system includes a parachute, descent vehicle, and an approach called a "skycrane maneuver" for lowering the rover on a tether to the surface during the final seconds prior to landing. This type of landing system provides the ability to land a very large, heavy rover on the surface of Mars in a more precise landing area than was possible before Curiosity's landing. The Mars 2020 rover adds new entry, descent, and landing (EDL) technologies, such as Terrain-Relative Navigation (TRN). Terrain-Relative Navigation allows the rover to detect and to avoid hazardous terrain by diverting around it during its descent through the Martian atmosphere. A microphone allows engineers to analyze entry, descent, and landing. It might also capture sounds of the rover at work, which would provide engineers with clues about the rover's health and operations. The Mars 2020 rover design is largely based on the engineering design for Mars rover Curiosity. This reliance on a proven system reduces mission costs and risks. The rover's long-range mobility system allows it to travel on the surface of Mars over a distance of 3 to 12 miles (5 to 20 kilometers). The rover has a new, more capable wheel design, among other improvements. For the first time, the rover carries a drill for coring samples from Martian rocks and soil. It gathers and stores the cores in tubes on the Martian surface, using a strategy called "depot caching." Caching demonstrates a new rover capability of gathering, storing, and preserving samples. It could potentially pave the way for future missions that could collect the samples and return them to Earth for intensive laboratory analysis. The Mars 2020 rover helps prepare for future human exploration of Mars with a technology for extracting oxygen from the Martian atmosphere, which is 96 percent carbon dioxide. This demonstration of new technology helps mission planners test ways of using Mars' natural resources to support human explorers and improve designs for life support, transportation, and other important systems for living and working on Mars.